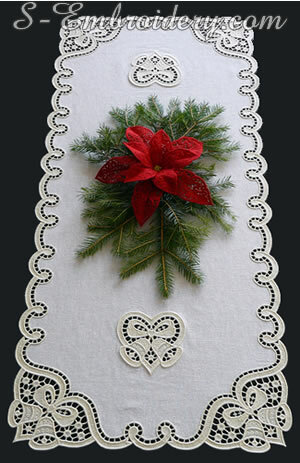 A set of 5 Christmas free standing lace machine embroidery designs. 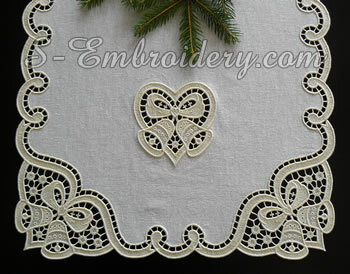 The 3 edging designs have sizes from 1.67 x 2.94 inches (42.4 x 74.8 mm) to 1.67 x 9.02 inches (42.4 x 229.2 mm). The number of stitches varies from 4,516 to 13,634. 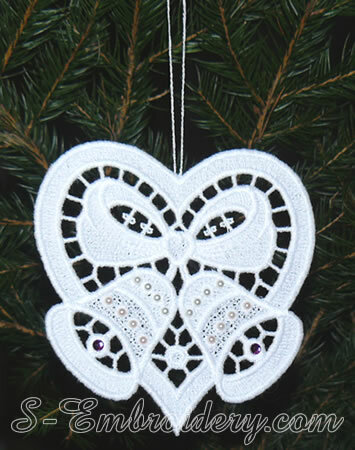 You receive the 3 versions of this Christmas machine embroidery design - 2 free standing lace Christmas ornaments (one for decorating your hand-made Christmas cards and one with loop for hanging on the Christmas tree) and a cutwork lace embroidery version. The size of the 3 versions is between4.17 x 1.17 inches (104.8 x 105.8 mm) to 4.13 x 4.79 (104.8 x 121.6 mm) and the number of stitches - from 27,093 to 27,835. The table runner which was created using this set measures approximately 15.2 x 35.6 inches (38.5 x 90.5 cm). 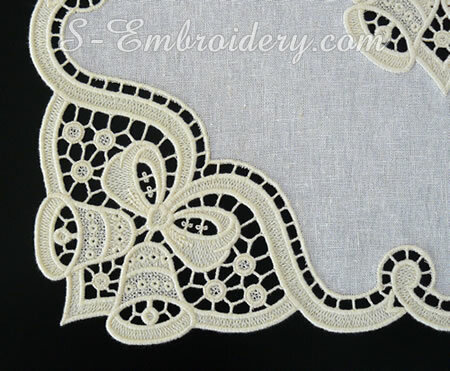 Using the 3 free standing lace border designs in different combinations you may create a table runner (table top or table cloth) with a size that would better match your Christmas embroidery project. The set comes with instructions in PDF format for creating the table runner, featured on this page. 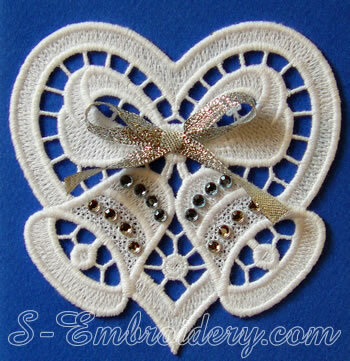 The larger designs in this set will require a hoop with a correspondingly large working area for uninterrupted stitching. If you have a hoop with an working area which is large enough to stitch out the entire design but you do not see your machine's format, please let us know. 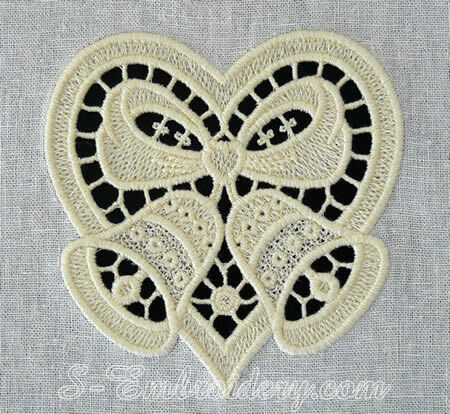 The Christmas bells heart design will fit in 5x7 (130 x 180) hoops and can be purchased separately as SKU 10594 Christmas bells and heart embroidery set.